DriversEd.com has changed over time since they have been around for so long. They created their first online course in 1997 when online driving schools first became available. The most recent upgrades they implemented are more modern 3D graphics and animations. It was a vast improvement and we’re happy to say they receive our 5 star rating. Company Reputation: Just like in many of our other reviews, one of the first things we look at is a proven reputation and a solid business history. In addition to their 15 year history, this is the largest and most visited online drivers education site in the nation. They’ve also maintained an A+ rating with the Better Business Bureau. DriversEd.com exceeds all of our strict TSC Certification Requirements. What we’re trying to say, is, we like their reputation a lot. It’s among the best in the business. Free To Try: One of our other favorite features is the “try before you buy” motto that they have. You are able to take the first 20% of their course without providing any payment information. This is not only true for their online traffic school courses, but it’s also the case for their online drivers ed courses (free to try is more rare with online drivers ed). Even after you supply payment info, you are still able to get your money back until you’re finished. Interactive: In terms of being an interactive course, this is as good as they come. The Drivers Ed course is cram full of games, crossword puzzles, interactive quizzes, videos, animations, etc. They claim on their site that they want to entertain and teach at the same time. While we can think of better things to do on a Friday night, this course does a great job at keeping things fresh. Behind The Wheel Options: You don’t have to use a second drivers ed school for the behind the wheel portion. In most areas, DriversEd.com will send a driving instructor to your house for the behind the wheel requirements. Many other online drivers ed programs are unable to offer this. It’s a huge advantage to DriversEd.com. Minor Glitches: DriversEd.com offers both a flash version as well as an HTML version of their course. We found the flash version to be buggy and it simply didn’t run well. Trying to use our iPhones, as expected, didn’t work at all since the iPhone doesn’t have the ability to run flash. The standard HTML version, while 95% error free, did actually include some flash videos that we were unable to see. We do not recommend you use the flash version of their course even with the best of PC’s and be prepared for a video or two that won’t play even in the HTML version. It seems the course also does not work very well with the web browser Mozilla Firefox. If you are using Mozilla Firefox, you may need to switch to another browser or you might want to sign up for another course. Course Timers: The online traffic school courses, like any others, require course timers to be used. This is a requirement by the courts and not a choice feature that DriversEd.com uses. However, it’s an annoyance you should be prepared for. Even if you’re done reading a page, you may need to wait until the timer counts down. Course timers are not used in their Drivers Ed programs. 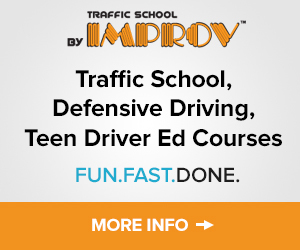 Since DriversEd.com is the most popular online drivers ed course, they have lots of funding and are able to remain very competitive in their pricing. They also offer a higher than average product, making this a phenomenal deal for the majority of people. DriversEd.com is an excellent online driving school and has earned our 5 star rating. We recommend you try out their course since you can take the first 20% without giving up any payment information. It’s hard to be the most popular online driving school if you aren’t doing a few things right! Use This 5% Discount Link or enter promo codemydriversedyzx during registration. 3D animations, videos, and modern interactive features. Works well on mobile devices. Not approved in some states. I GOT MY LICENSE!!!! Thank you!!!! Great school! Loved it! Loved it. Great course and it actually is pretty humorous. VERY easy.